Bengaluru Bulls vs Jaipur Pink Panthers Pro Kabaddi 2016 Live Streaming: The Pro Kabaddi 2016 and the Season 4 has begun with the battle of Puneri Paltan vs Telugu Titans on June 25 at NSCI SVP Stadium, Mumbai. 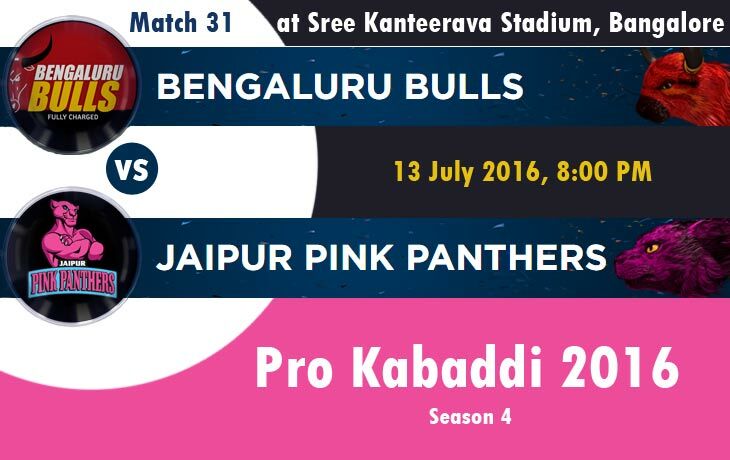 Now, today on 13th July 2016, the Match 31 will be for Bengaluru Bulls vs Jaipur Pink Panthers at Sree Kanteerava Stadium, Bangalore. Scroll down and get the Match Updates and Pro Kabaddi Live Streaming Info. Bengaluru Bulls played eight games with three wins, four losses and one tie with the points of Twenty. So, the team standing in the sixth position of PKL 2016 Points table at present (July 13, 2016) and today’s match will be the Ninth game against with Jaipur Pink Panthers. At present. This 31st match will be held at the venue of Sree Kanteerava Stadium, Bangalore on July 13th, 2016. The Opponent team, Jaipur Pink Panthers is standing on the Third position with the points of 35 by four wins, two losses, and one tie off its Seven played. So, it is an Eighth match for the Jaipur Pink Panthers in this Pro Kabaddi Season 4. Pro Kabaddi Season 4 Points table & Standings last update is July 13, 2016 (08:40 IST). This Points Table and Standings will not be updated after this Match. Please Visit the Pro Kabaddi 2016 Schedules and More Update Page to know the current points table.